The Series RHP-W Wall Mount Temperature/Humidity/Dew Point Transmitteris the most versatile room transmitter on the market. The stylish housing is well vented to provide air flow across the sensor to improve measurement accuracy. An optional LCD display can be integral to the transmitter or a remote display can be ordered for building balancing or LEED® validation. 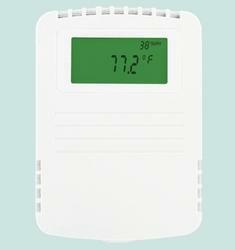 The LCD display indicates the ambient temperature along with the humidity or dew point. The transmitter has internal dip switches to select the temperature engineering units and whether the transmitter outputs humidity or dew point.The humidity and temperature sensors are field replaceable to reduce service cost and inventory. The humidity and dew point can have either a current or voltage output, while the optional temperature output can be a current, voltage, RTD or thermistor. Thermistor or RTD For models with current or voltage for the temperature output, the temperature range is field selectable. The Series MAFS is ideal for use with Dwyer Instruments, Inc. precision air velocity gages, transmitters and switches. The Series MAFS uses evenly distributed total and static pressure measuring points to deliver an accurate measurement of flows in a duct. The blade profile provides enhanced performance with minimal flow disruption in the air stream. Theair flow measuring probe can be completely installed from the outside of round or circular ducts, making it very quick to install. With its lightweight and durable construction, in addition to its ease of installation, the MAFS flow sensor lends itself superbly to applications in the HVAC industry. The Series PAFS-1000 Averaging Flow Sensor is ideal for sensing differential pressure in the inlet section of variable air volume terminal units and fan terminal units. Units can also be used to sense differential pressure at other locations in the main or branch duct systems. The “H” port senses total pressure and the “L” port senses static pressure. The difference between these signals is the differential, or velocity pressure.For models PAFS-1002 to PAFS-1005, up to four sensing points and lengths of 3-5/32 to 9-29/32 (8.02 to 25.26 cm) to accommodate box size diameters of 4 to 16 (10.16 to 40.64 cm) are available. For models PAFS-1006 to PAFS -1011, up to 10 sensing points and lengths from 12-1/2 to 23-29/32 (31.75 to 60.72 cm) are available to accommodate appropriately sized duct dimensions . 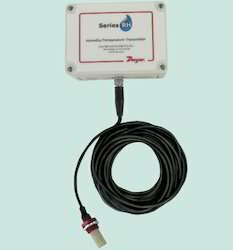 The Series WHP Wireless Humidity/Temperature Sensors provides flexibility in locating sensors and reduces wiring cost. Using a 418 MHz transmitter, the sensor can transmit data up to 100 feet without the use of a repeater.When coupled with a receiver and output module, the Series WHP can output voltage, current or resistance values for humidity and temperature. Since the unit is battery powered, users can change the location of the sensor by a couple of feet or to a different wall without worry about extra labor cost. With the transmit rate at approximately one reading every 10 seconds, the battery isestimated to last 5 to 8 years. The duct mount and outside air mount sensors come standard with sintered filters to protect the sensor from particulates. 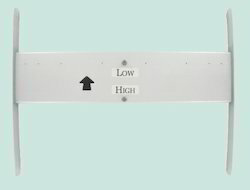 Set point adjustment and/or manual override buttons are available on wall mount sensors. Power Requirements: (2) 3.6 V ER14505AA lithium ion batteries, included, user replaceable. 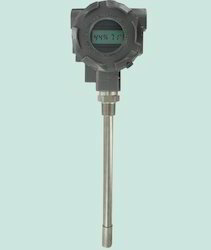 The Series STRA Airflow Measurement Stationis easy to install – simply connect the tubing to the station fittings, then to a differential pressure manometer, gage, transmitter or switch. Single or multiple airflow elements are factory mounted and pre-piped in a casing designed for flanged connection to the ductwork. The Series STRA utilizes an airflow averaging element in a head-type device, generating a differential (velocity) pressure signal similar to the orifice, venturi, and other head producing primary elements. The Series FLST Airflow Measurement Stationis easy to install – simply connect the tubing to the station fittings, then to a differential pressure manometer, gage, transmitter or switch. Single or multiple airflow elements are factory mounted and pre-piped in a casing designed for flanged connection to the ductwork. Standard materials consist of a G90 galvanized casing and 6063- T5 anodized aluminum flow sensors, suitable for most HVAC applications. The Series FLST utilizes an airflow averaging element in a head-type device, generating a differential (velocity) pressure signal similar to the orifice, venturi,and other head producing primary elements. Strategically located sensing ports continually sample the total and static pressures when inserted normal to flow. Total pressures sensed by the upstream ports are continually averaged withinthe airflow element in an isolated chamber. The static sensing ports are averaged in a second isolation chamber. Multiple elements are joined together for connection to a differential measurement device (gage, transmitter, etc.) forflow measurement and indication purposes. The Model FAFM Fan Inlet Air Flow Measuring Probes use evenly distributed total and static pressure measuring points to deliver an accurate measurement of flow in a fan inlet. The Air Flow Measuring Probes can be completely installed from outside of the fan making it ideal for when proper duct locations are unavailable.With its lightweight and durable construction in addition to its ease of installation, this product lends itself to being used in the HVAC industry. There are two versions of the model FAFM fan inlet air flow probes to choose from depending on the depth of the fan inlet. The Model 670 Fume Hood Monitor continuously senses air flow through the face of the fume hood, ensuring safe levels of fresh air are exhausting potentially hazardous fumes eliminating operator exposure. The 670 provides a highly accurate hot wire sensor to detect very low flows common on fume hoods. LED safe and alarm status indicators, audible alarm with temporary or permanent horn silence, relay alarm output, sash alarm input and an input for night set-back. The Model 670 comes with everything required to quickly install the unit including a mounting bracket, 24 of tubing for connecting to the inside of the hood wall and a 120 Volt AC power adapter. The Series HHT Hazardous Area Humidity/Temperature Transmitter takes accurate measurements in the harshest of environments. The transmitter is offered in explosion-proof and intrinsically-safe versions depending on the application’s requirements. The explosion-proof model is offered with 4 to 20 mA output for humidity only. The intrinsically-safe version is offered with 4 to 20 mA output for humidity and temperature. Both versions have an optional two line alphanumeric display to show the current humidity and temperature. The Series HHT humidity/temperature transmitter is excellent for offshore. HVAC applications, dust and grain applications. Intrinsically safe models require an intrinsically safe barrier. 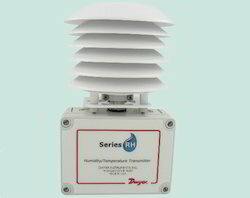 The Series RHRS Radiation Shield protects outside air humidity transmitters from rain and radiated heat. With the curved shape and color of the plates, air flow is able to move across the sensor to keep radiated temperatures from rooftops and surrounding surfaces from affecting humidity readings. For ease of installation, the Series RHRS has integral pipe mounting hardware which can be removed for surface mounting applications.The brackets on the Series RHRS are specifically designed to be installed on the Dwyer Series RHP outside air humidity transmitters with sintered filters.The pipe mounting bracket fits 3/4 to 1-1/2 iron pipe. The Series RH-R is ideal for environmental chambers, rubber bladder burst detection and air handler applications. 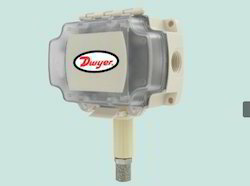 The compact sensor is protected by a removable filter. It can be mounted up to 16 feet away from the weatherproof base. 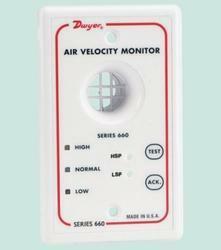 Looking for Dwyer Air Quality Products ?